Do your guests have a hard time finding their way to the rest room or toilet in the dark? 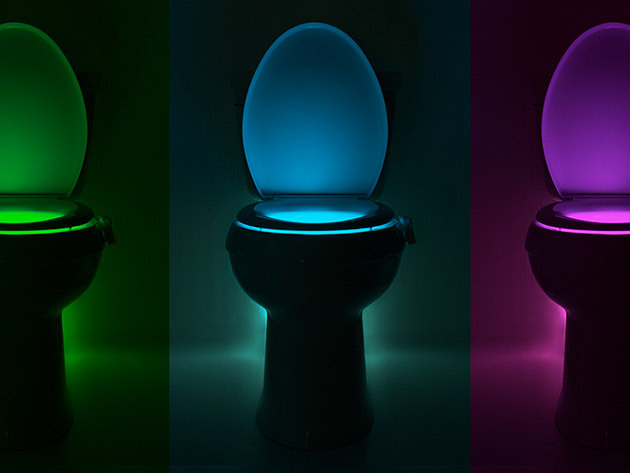 I just discovered these cute toilet night-lights which can help guide them...there are a few different brands but "Illumibowl" seems to be a major one --- I think they look pretty cool!! I like the purple...apparently you can set the gadget to have whatever color light you want. Larry (my DH) would love that! I prefer not to clean poo from the lights. I have a night light in my bathroom as well as small l.e.d flashlights on the bedside tables. However, these look fun, for display. I wonder if Amazon has ones the flash with music for the holidays !! I have 6 grandkids. There's already enough imaginative things in the toilet, like most recently, a big bar of my pink soap.